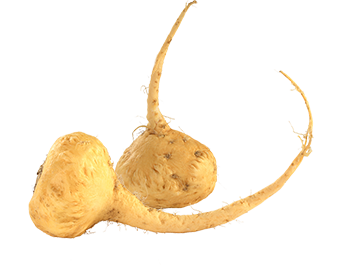 Special maca roots with a higher content of Glucosinolates are used to make MacaXtra®, a standardized powder of 100% organic maca root with a minimum content of 1% Glucosinolates. The fine, free-flowing formula of MacaXtra® comes ready to encapsulate or press into tablets. With a lightly sweet and malty flavor, it is also a popular ingredient in powdered supplements and smoothie mixes. Maca is known as Peruvian Ginseng, not because it is related but because its properties are very similar. Maca’s stamina enhancement and energy boosting potential make MacaXtra® a natural fit for the sports functional food and drink markets. MacaXtra® is an excellent superfood addition to protein powders, energy bars and drinks, tea and coffee blends, dark chocolate, baked goods, breakfast cereals and healthy snacks. Dried Maca is rich in protein and lipids. It contains a number of sterols, including sitosterol, campestrol, ergosterol, brassicasterol and ergostadienol. Maca is also a good source of iron, magnesium, calcium, potassium and iodine. Maca is mostly known for its outstanding stamina enhancing properties. The key to Maca’s stamina effects appears to be two groups of novel compounds called macamides and macaenes. Maca is not a stimulant; rather, it is an adaptogen or stress-adaptor, helping the body adapt to environmental factors and avoid damage from these factors. It aids energy and endurance, helps to maintain a healthy immune system and re-mineralizes poorly nourished bodies. Maca is also well-known as a natural hormone balancer used traditionally to enhance sexual function in both men and women, to increase fertility and to help alleviate menopause symptoms. Maca has also traditionally been used to help to support joint and respiratory health and to improve mood and support memory functions. Maca grows in the harshest, most difficult farmlands in the world. It grows at elevations between 10,000 and 15,000 feet, on the barren high plateaus of the central Andes, where it withstands intense sunlight, fierce winds, and sub-freezing temperatures. Surprisingly, Maca thrives in these conditions. Maca has been a staple crop of the people of the high Andes for centuries. Traditionally it was consumed cooked as a root vegetable or made into flour to produce bread and baked goods. The formidable imperial warriors of the Incan army reportedly ate Maca to fuel their legendary strength. Maca was also used as currency and later became part of the tribute paid to the Spanish conquerors. Not so long ago, Maca was placed on a list of endangered plants. Now, because of rapidly growing popularity worldwide, thousands of acres of Maca are cultivated in Peru. Our MacaXtra® is organically grown in Peru by subsistence farmers using traditional farming practices providing them with a sustainable source of income in a region where little else grows.